The big news is that painting is complete! And in the process, I helped prove that Dark Matter does indeed exist in the universe, as a lot of it tried to embed itself in my white paint job! 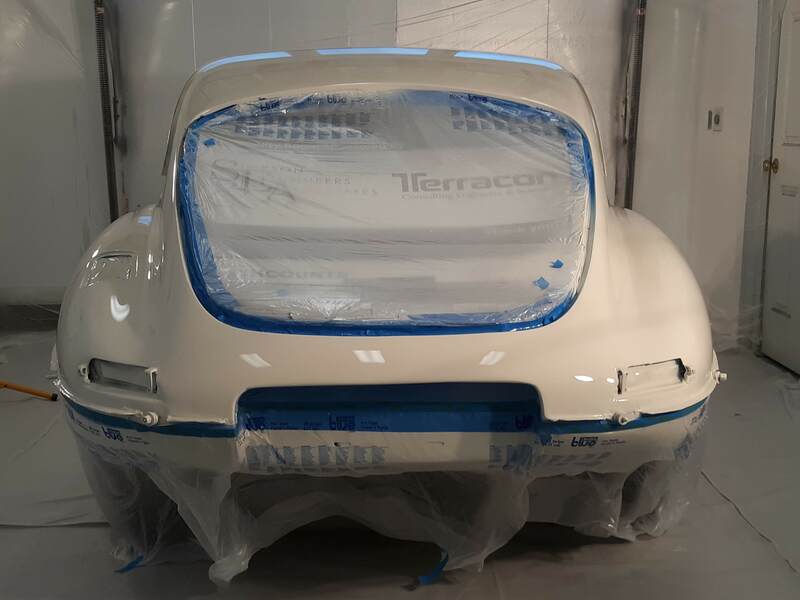 As discussed in other articles here and here, I decided to leave this car in Old English White using a basecoat/clearcoat paint system. An advantage of white paint is that it can trick the eye into not seeing issues like wavy panels. A big downside, as I found, is that it is very hard to get a white paint job that is totally free of dark colored dirt, dust, and debris that will show up under close inspection. 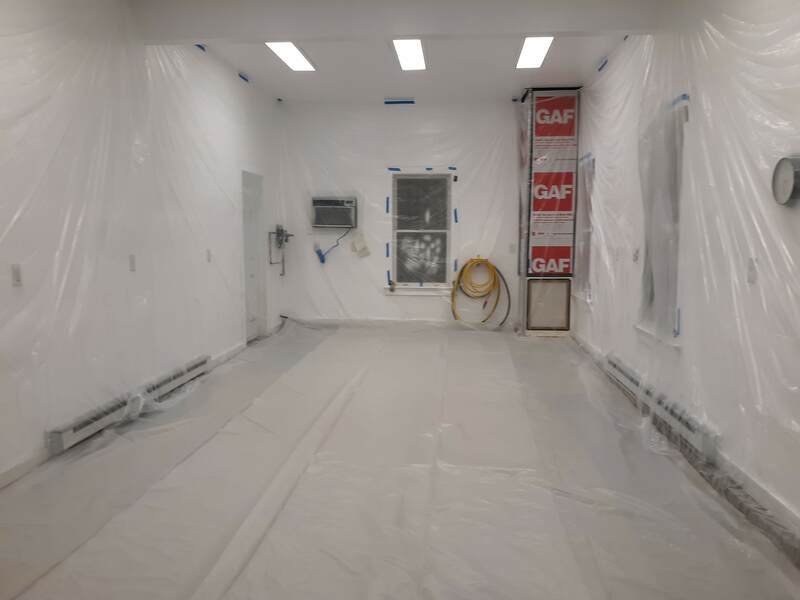 I had already set up a dedicated paint booth in my shop building with an air circulation fan. The sheet rock walls were freshly painted and to look at it, it was a clean environment. But as I was to find, to get the air in the room really clean was quite a trick. I had a discussion with my wife Kelli about hospital clean rooms, which she knows quite a bit about. At her suggestion, I hung thin painters plastic on all the walls. Not only does this provide an additional barrier, especially over the garage door, but it has takes on a mild static charge that attracts particles. The floor was lined with a heaver grade of plastic sheeting. Then I ran the circulation fan through dust and pollen grade filters for at least 12 hours before each paint session. I bought new air houses with filters. I bought Tyvek suits and shoe covers to wear. And I bought a new Tyvek hood for my supplied air system. Next, I adjusted my process. In a perfect world, the basecoat is applied and 30 minutes later the clearcoat is applied. Typically 3 coats of basecoat and 3 coats of clearcoat and you are done. I tried that the first time. Unfortunately, there were multiple black specs in the paint job. So I changed my approached. I applied 3 coats of the white basecoat. After an hour or so, I inspected it closely with a good light. Any black specs were either sanded out or covered up with additional white paint. Once I had a perfect coat of white basecoat, I then applied the clearcoat. I typically did find black specs in the clearcoat but the advantage is that the clearcoat can be sanded and in most cases the debris will be sanded out. Of course there is always a catch. If the debris is very deep in the clearcoat, you will sand through it to the basecoat. The repair for this situation requires that the sanded through area have more white applied over it locally and then the clearcoat must be applied over the entire panel. 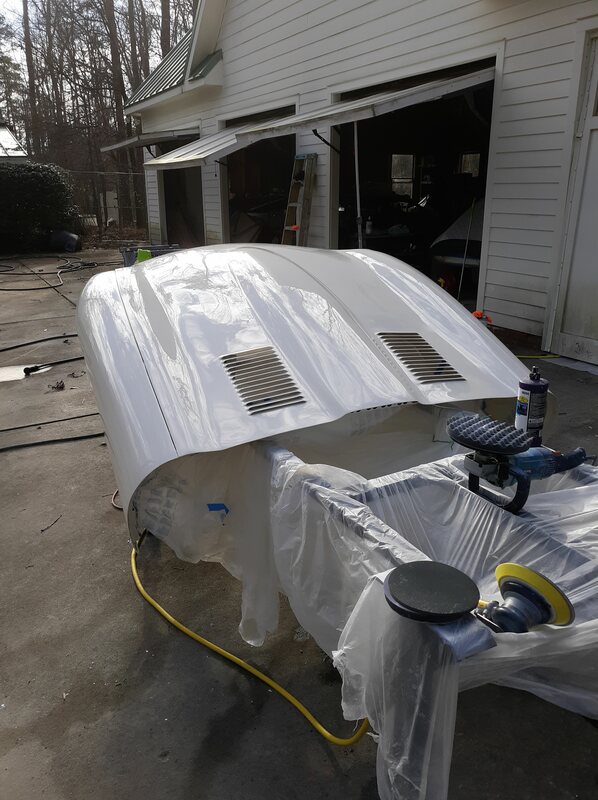 As a consequence, both the body and the bonnet wound up with multiple coats of clearcoat. Another tip is to keep the plastic “fresh” that masks off the parts of the car you don’t want to paint. Every time you spray paint, some of it lands on the plastic. It dries there but is brittle and can flake off and land back on to any fresh paint that you are applying. Eventually, all of the clearcoat gets sanded and polished. Sanding involves 1500, 2000, and 3000 grit papers. Polishing (I use 3M products) involves 3 levels of product also. When you are done, the shine is brought back and you have a highly reflective finish. In these articles, I’m trying to give my readers a feel for restoration costs. Most folks have heard numbers all over the board about the costs of paint jobs. Here is my experience. For this restoration, I am keeping a spreadsheet with my hours and costs. To date, my manhour total is running at 500 hours. 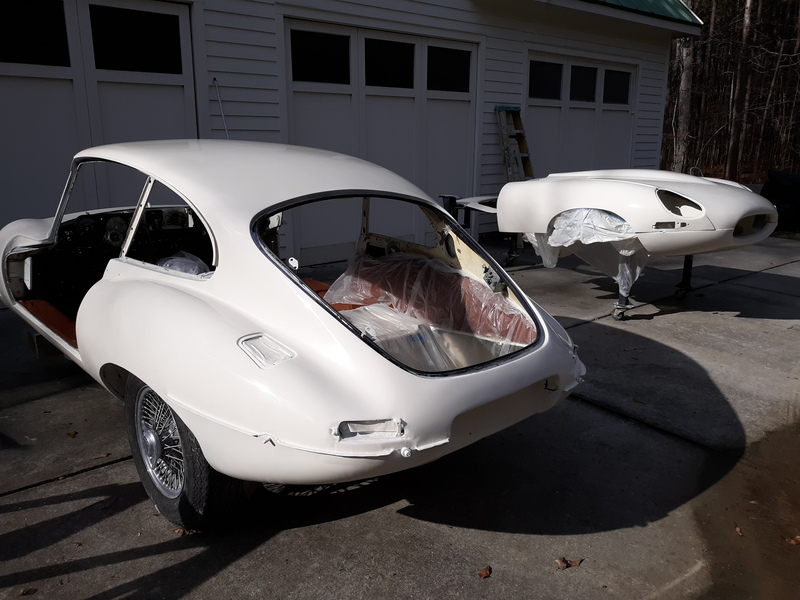 Most of this time was spent disassembling the car, adjusting the bonnet for a good fit at the cowl, installation of the Monocouque Metalworks covered headlight kit, repair of all bodywork blemishes, prime, paint, and post-paint sanding/buffing. The covered headlights work appears to have used about 50 hours. 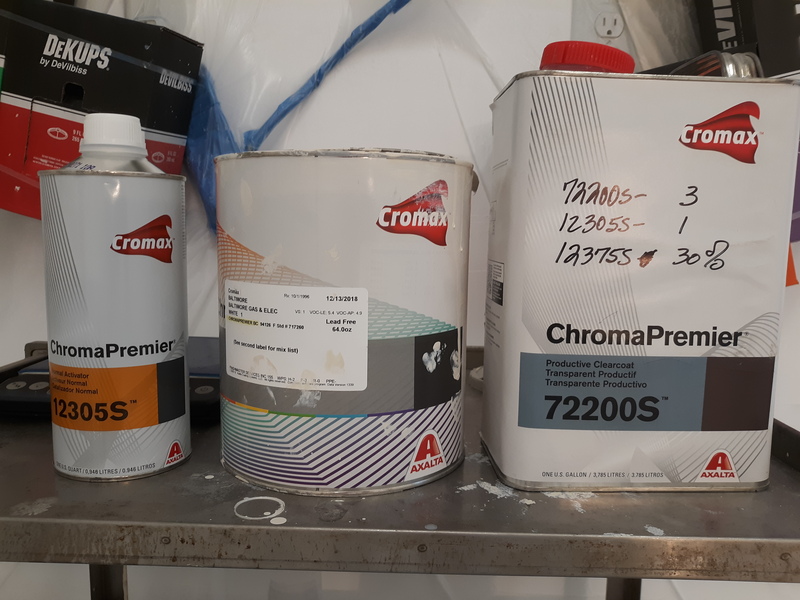 I spent about $2800 on paint and related materials. If I were to charge my labor at $50/hour, we would be looking at a bill for the paint job of $27,800! Of course, my labor is technically free and there is no doubt that as someone who only paints a car every once in a while, I am not very efficient. So you might want to mentally adjust that labor number downward. I used top quality Axalta (formerly Dupont) paint products. For example, a “ready to spray” gallon of white basecoat is about $800. On the flip side, this job required almost zero work for rust repair. Rust repair can be extremely complex and costly. For instance, watch the first 5 minutes of this video (https://tinyurl.com/y88u2fbn) and you will be witness to sort of a worst case scenario! So the take away message is that paint jobs are time consuming and expensive. Of course, the paint job is the first thing you will see when you walk up on a car. For me, doing the job right was worth the effort!